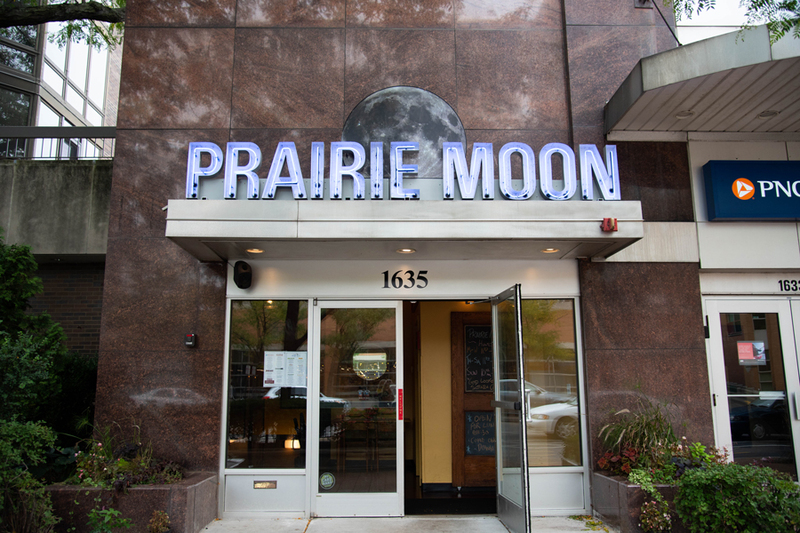 Prairie Moon, at 1635 Chicago Ave.. Following a soft open at the end of August, the restaurant celebrated its grand re-opening Sept. 28. Prairie Moon celebrated its grand re-opening in style on Friday: with plenty of beer, a DJ, oysters and balloon animals. The restaurant, which had been previously located at 1502 Sherman Ave. had to close — 16 years to the day after it opened — in preparation for the construction of Albion Residential’s planned 15-story apartment tower. Now, the restaurant has moved into its new location at 1635 Chicago Ave., the former home of longtime Evanston staple Dave’s Italian Kitchen. Following a soft open at the end of August, Prairie Moon celebrated its grand re-opening Sept. 28. When the Albion Residential tower is complete, Prairie Moon’s owners will get a space in the new building. Owner Rob Strom said he and his team are developing an entirely new concept for the restaurant, which will most likely feature a seafood-based menu. Strom said he’s happy with the new space, which is a bit cozier than the previous location — there is no more outdoor terrace or private dining room. It’s also a basement layout, which he said concerned him a bit at first, but did not deter customers from filling the space during opening night. In addition to a new layout, Strom said the new location’s kitchen is significantly larger than the old one, which has allowed him to experiment with the menu and add new dishes. The type of cuisine is still the same, Strom said, but the restaurant will be incorporating new menu items on a weekly basis — which have been received well by customers so far. Marketing manager Scott Anderson said the move took longer than they had originally anticipated, but that much of the restaurant’s old staff has followed them to the new location, which is closer to Northwestern. He said he hopes their new proximity to campus will lead more students to frequent Prairie Moon. Paul Zalmezak, the city’s economic development manager, said in May that the move helps occupy a space that would otherwise be difficult to fill because of its configuration, and that the restaurant will serve as an anchor for the north end of that block of Chicago Avenue. The kitchen is not the only upgrade in the new location. Prairie Moon’s new bar features more beers on tap than it did before. Benjamin Gerts, of Temperance Beer Company, an Evanston-based brewery, sells his beer to Prairie Moon and was at the opening. During the opening, he said he was happy with the feel of the new space — especially the expanded bar. Tori Foreman, an Evanston resident, attended the opening with a friend. She said the new restaurant is convenient and centrally located, and though it feels familiar, the Prairie Moon ambiance remained.